One of the things I—and no doubt all SLO County citizens—admire about the SLO County Board of Supervisors is that it’s a nonpartisan governing body that’s only concerned with working together for the betterment of the county. These five selfless public servants set aside their personal ideologies to collaborate as colleagues and work on behalf of all residents because they know rank liberalism or conservatism has no place in county government. Instead, it’s about finding common ground and compromise, about being respectful of the nonpartisan nature of the offices they hold. That’s why I’m just swelling with pride (at least I think it’s pride; maybe I should have it looked at) over the smooth transition of power that occurred on Jan. 10 at the supervisors’ meeting, where Vice Chair and 3rd District Supervisor Adam Hill was elevated to chair as tradition dictates in a unanimous 5-0 vote. That’s because local politics is more honorable than the cesspool that is national politics. Yes! So. Damn. Proud. Except that’s not what happened, not at all. Instead, the conservative board members voted 3-2 to install brand spanking new 1st District Supervisor John Peschong as the new chair because local politics is just as contentious, partisan, and downright ugly as the Washington, D.C., dumpster fire. Who cares about tradition and experience when you can use your partisan majority to steamroll your opposition? It’s pretty much the same thing that happened two years ago when Peschong’s predecessor Frank Mecham was up for the peaceful transition of power—same whining, same anger, same carrying on, and same indignity. Only last time the complaints were about the board being a boys’ club, which aren’t relevant this time. Fourth District Supervisor Lynn Compton and 5th District Supervisor Debbie Arnold did a helluva job swooping meeting-helming power away in 2015, and helped do precisely the same thing this time around. Good job, guys! Way to show the county how one-sided you really are. Mecham didn’t get his chance for the 1st District in the last five years, so let’s give it to the guy who’s been on the board for the shortest amount of time. Peschong’s served as a county supervisor for three weeks! He definitely deserves to wield the gavel. Wait a minute: Was this your plan all along? Conspiratorial conversations behind closed doors, not via publicly accessible lines of communication, to get the big, bald, badass Republican political operative a seat at the center of the dais? I’m just saying: It’s weird that everyone who spoke against Hill used the same exact talking points. Except instead of the Birkenstock brigade “intimidating” the new board majority to follow protocol and install last year’s vice chair as this year’s chair, Brown and COLAB did the intimidating, breaking with tradition and leading to the 3-2 defeat of Hill as chair. I’m starting to believe Hill’s complaints about the swirling conspiracies against him. If Hill’s “tone” was really the issue, why not give Gibson a chance to chair things? He’s liberal—and yes, we all agree that he’s sassy—but that would have made the aforementioned allegation about Hill’s temperament a little easier to swallow as the truth of the matter. Instead, all I’m swallowing is an obvious partisan power play. My favorite part of the meeting was when Hill and audience members called out COLAB’s outsized influence over conservative board members. One speaker referred to Compton and Arnold as “lapdogs” of COLAB’s “new world order.” Brown had his own “you lie!” moment when he called out from the gallery as Hill criticized his organization, accusing Hill of “castigating” COLAB. Talk about tone! I wonder if he can spell “castigate.” That’s a pretty big word for a guy who has trouble spelling “activists.” After the huffy outburst, Brown left the room followed by a SLO County Sheriff’s deputy but returned later after the vote. So here we go again. More anger. More acrimony. Less unity. Go SLO County! Way to stick with tradition. It’s time for all our local elected officials to pull the collective sticks out of their ideologically plugged asses and face the county without the chilling effect rhetoric can have on compromise and establishing good policy for the future. We’re going to have more partisan politics than we can stomach coming out of D.C. 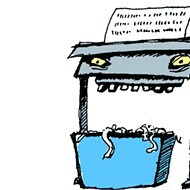 The Shredder asks, “Can’t we all just get along?” Send ideas and comments to shredder@newtimesslo.com.